The number of landlords facing lawsuits due to lease termination has increased tremendously in the last couple of years, according to legal expert Helen Hunter. This has caused many landlords to unnecessarily face legal procedures. Landlords can avoid problems when terminating tenant lease if they follow the correct procedures. For instance, Hunter points out there are many state and federal laws that prevent landlords from terminating leases without any reason. Once the warning letter has been issued, the landlord should keep a strict watch on the tenant. Any further violations of the lease agreement can give the landlord legal right to terminate the agreement. The landlord should ensure that he or she too keeps to the terms of the agreement. The property should be habitable and any complains from the tenant should be dealt as soon as possible, so that the tenant does not have any grievance against the landlord. When the landlord maintains his or her position, and the tenant does not, then the landlord has the right to terminate the agreement. Usually, if the tenant falls behind in payment of rent, many state laws allow the landlord to terminate the lease by giving a 3-day or 5-day notice. The same is also true if the tenant creates a nuisance and ruckus and thereby disturbs the peace of the building or neighborhood. No tenant is allowed to use the rented property for criminal or unlawful activities. 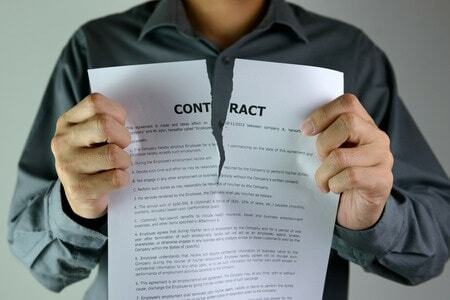 If the landlord finds out that the property is being used for unlawful activities, he or she has all the rights to issue a tenant lease termination letter. Looking for a new tenant? Use AAOA’s tenant screening packages to avoid future problems! The termination should be done in writing and state the reason. Invariably, landlords find it difficult to draft lease termination letters. In such cases, the Internet proves to be a boon. Hunter suggests the website legalcybertips.com for sample letters of tenant lease termination. The website is of great help to landlords who are looking for advice and tips on how to avoid legal problems when evicting tenants. Many tenants claim that the landlord is at fault and file a counter case. This can prove to be financially sapping, and the landlord may end up paying court fees from his or her own pocket. Hence, a common question amongst landlords is should a landlord form an LLC to avoid legal as well as financial issues when the tenant decides to take the landlord to court because of the lease termination letter. Hunter’s advice to all landlords is that an LLC can prevent the personal assets of the landlord from being claimed against damages should the court unfortunately decide in favor of the landlord. Also, all expenses related to maintenance and repairs of the house are borne by the LLC. At the same time, Hunter warns that there are some obligations that the landlord is personally responsible for and not the LLC. Therefore, a landlord should fulfill those obligations. “Landlords should also spend some time understanding how landlord insurance works,” claims Hunter. The insurance can help pay for any intentional damage caused by the tenant when being evicted from the property. “Unfortunately, it has become a norm among evicted tenants to thash the apartment before leaving the premises.” Having landlord insurance can help the landlord undertake major repairs and maintenance work. The insurance will also protect the landlord in case of natural calamities like floods or hurricane.